Thanks to no-cost expertise and connections shared by the Small Business Development Center (SBDC) at Southern Illinois University Edwardsville, a new insect control franchise is ready to eliminate flying pests for residents and businesses in Madison County. 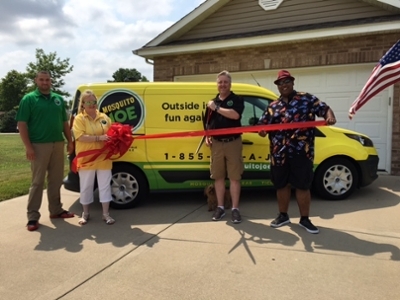 Mosquito Joe of Madison County, a franchise owned by Granite City resident James “J.P.” Newcomer, opened for business on May 23. Newcomer, a business process analyst at Monsanto and a U.S. Air Force retiree, was searching for a franchise opportunity to operate in the Metro East. After working extensively with a franchise consultant in North Carolina between 2015 and 2016, Newcomer decided upon the mosquito control market. A Mosquito Joe pest control yard application eliminates biters for 21 days. The trained technician achieves these results by targeted shrubs and plants with a barrier spray that kills mosquitoes on contact and bonds to foliage, where it acts as a repellent for weeks to come. SBDC Small Business Specialist Jo Ann DiMaggio May began assisting Newcomer in March. “Jo Ann was incredibly helpful, offering essential information about what I needed to do to open a franchise in the state of Illinois,” said Newcomer. “There was so much to know in terms of applying for an SBA loan, becoming licensed as a pesticide applicator and more. Once I passed the required state exams, I found that obtaining a state license could take from four to six weeks to complete and could delay, or potentially prevent, my business from opening. DiMaggio May said providing expertise to Newcomer was easy because he was very well organized and a hard worker. Photo: Mosquito Joe of Madison County owner James “J.P.” Newcomer and staff cut a ribbon, marking the launch of their insect control franchise.